Register for Thai Massage workshops and classes with Eric Spivack in Seattle. All courses qualify towards fulfilling state and national continuing education requirements. $100 of the class fee is a non-refundable deposit to hold your space in the class. If you cancel with less than 14 days notice or fail to show for class, your tuition will be forfeited. In the event the workshop is canceled by the instructor, a 100% refund will be issued. Prices are based on full payment at least 2 weeks prior to the class. Since class size is limited, space will be granted on a first-come, first-serve basis. Therefore, early registration is strongly advised. Please specify to which workshop you would like your deposit applied. In this new advanced 1-day Intensive, you will learn techniques to increase the dynamic quality of your existing Thai Yoga Massage sessions. Using your hands and feet, you will practice incorporating rocking, subtle vibration, and movement which increase range of motion and move stagnant energy in soft tissues and joints. Mastering these techniques will help your clients reduce muscular holding patterns and help them get into a parasympathetic state to allow for healing at a deep level. The course will have lecture, demonstration and hands-on components. Class size is limited, thereby offering the opportunity for more individual attention and instructor feedback. 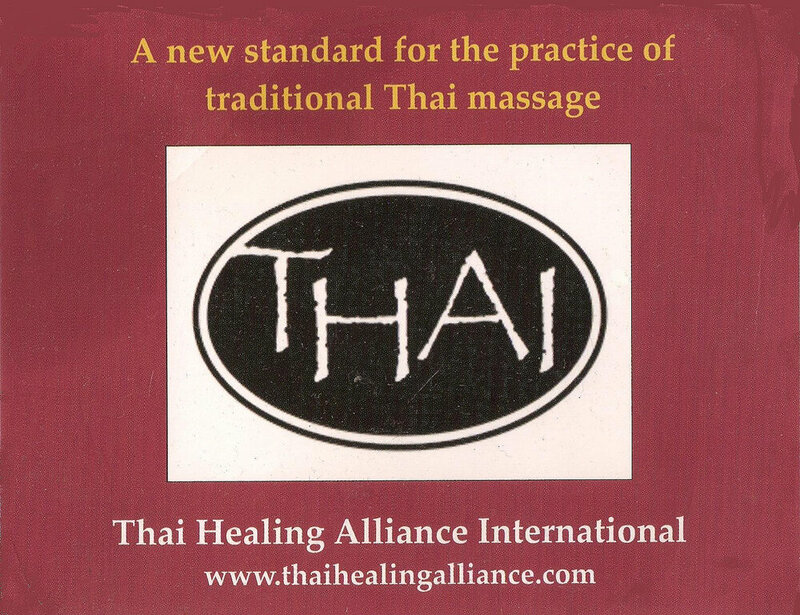 Participants will receive a Certificate of Completion for 8 NCBTMB + Thai Healing Alliance International CE hours. Prerequisites: Level 1, logging 10 practice hours, and having received a 90-min Thai Massage from Eric. 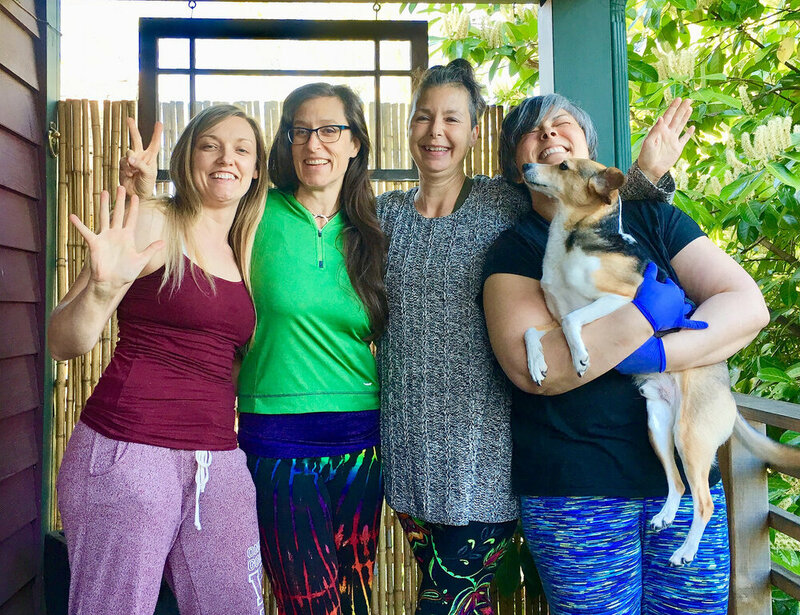 In this one-day intensive Level 3 workshop, participants will learn to skillfully integrate a variety of advanced level poses into the Thai Yoga Massage routine learned in Levels 1 and 2. Level 3 material includes poses in the prone, side-lying, and seated positions and will aid the participant in offering a richer and fuller Thai Yoga Massage session that comprises a 2 - 2 1⁄2 hour session. Poses focus on legs, hips, low back, and arms. The course will have demonstration and hands-on components. Class size is limited, thereby offering the opportunity for more individual attention and instructor feedback. Participants will receive a Certificate of Completion for 8 NCBTMB + Thai Healing Alliance International CE hours. Prerequisites: A minimum of 4 technique classes with Eric. Based in the Ayurvedic tradition, Thai Yoga Massage is an ancient healing arts system that combines spiritual practice, acupressure, assisted yoga stretching, compression along energy (Sen) lines, gentle rocking and breathing techniques. This one-day hands-on workshop introduces several routines to address chronic upper back/neck/shoulder pain and headaches. Participants will practice proper body mechanics while learning to use their hands, forearms, elbows and feet to ease tension, bring about relief, calm the mind and balance energy. Class begins with yoga/meditation/breath work. The course will have demonstration and hands-on components. Participants will receive a Certificate of Completion for 8 NCBTMB + Thai Healing Alliance International CE hours. Prerequisites: Having taken a minimum of 4 technique classes from Eric and logging a minimum of 10 practice hours. Have you ever wondered how to design a 60, 90, or 120-minute Thai Yoga Massage session for general relaxation, lower body pain, or upper body pain? In this new 8-hr hands-on workshop, we will discuss the principles of sequencing Thai Yoga Massage poses, followed by demonstration and practice of 9 unique sequences for general relaxation, upper body conditions, and lower body conditions. This course will help you learn to efficiently select the most appropriate poses based on your clients' needs. You will be given a 3-ring binder with handouts of all the sequences covered. Participants will receive a Certificate of Completion for 8 NCBTMB + Thai Healing Alliance International CE hours. In this one-day intensive workshop, participants will learn a variety of advanced poses. Participants will continue to build sensitivity in their feet and integrate the poses more smoothly into a sequence that comprises a 2 1/2 - 3 hour session. Poses in this level address the lower back, hips, head, neck, and face. Prerequisites: None. This class is open to everyone. Thai Yoga Massage is an elegant and interactive form of meditative bodywork that combines assisted yoga stretching, acupressure, gentle rocking, and rhythmic compression along energy lines. In this 2-day workshop, participants will learn to effectively use their hands, forearms, elbows, and feet to open and gently release blockages that inhibit the flow of energy, or Qi. Essential elements of Thai Yoga Massage, its historical context, and fundamental techniques applied in the supine, prone, side-lying, and seated positions will be taught. Participants will receive a complementary workbook with photographs and detailed descriptions of an introductory sequence, which comprise a 60-90 minute basic full-body Thai Yoga Massage session. The course will have lecture, demonstration, and hands-on components. Class will begin each day with a yoga warm-up routine. 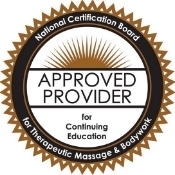 Participants will receive a Certificate of Completion for 16 NCBTMB + Thai Healing Alliance International CE hours. Prerequisites: None. This class is open to ALL bodyworkers. Acupressure is a major component in Thai Yoga Massage. In this one-day Intensive, you will learn to locate, palpate, and stimulate 65 of the most frequently used acupressure points in the body. You will also learn the theory of Yin-Yang, the indications for each point, and when to easily incorporate them into your sessions, whether you work on a mat or a massage table. Massage tables and Thai futons will be provided. Class begins with yoga/meditation/breath work. Participants will receive a Certificate of Completion for 8 NCBTMB + Thai Healing Alliance International CE hours. Prerequisites: Level 1 and having received a 90-minute Thai massage from Eric. In this one-day intensive Level 2 workshop, participants will review Level 1 material and learn to skillfully integrate intermediate level poses into a sequence that comprises a 1 1⁄2 - 2 hour session. Level 2 material includes poses in the prone, side-lying, and seated positions. The theory and location of the Sen energy pathways will be taught and discussed. The course will have demonstration, and hands-on components. Participants will receive a Certificate of Completion for 8 NCBTMB CE hours. Class size is limited, thereby offering the opportunity for more individual attention and instructor feedback. Participants will receive a Certificate of Completion for 8 NCBTMB + Thai Healing Alliance International CE hours. Prerequisites: None. Open to everyone. Thai Yoga Massage is an interactive form of meditative bodywork that combines yoga, stretching, gentle rocking, and rhythmic compression along energy lines. In this 2-day workshop, participants will learn to use their hands, forearms, elbows, and feet to open and gently release blockages that inhibit the flow of energy, or Qi. While traditional Thai Yoga Massage is performed on a mat, this class has been adapted to those who work on a massage table. It is suited for clients who are unable to receive bodywork on a mat and is a great way to introduce clients to Thai Yoga Massage. Essential elements of Thai Yoga Massage, its historical context, and fundamental techniques applied in the supine, prone, side-lying, and seated positions will be taught. Participants will receive a complementary workbook with photographs and detailed descriptions of an introductory sequence of poses, which comprise a 60-90 minute full-body Thai Yoga Massage session. Participants will practice draping techniques and learn when to integrate a variety of bodywork techniques such as Swedish, Deep Tissue, and Reflexology into this routine. Class will begin each day with a one-hour yoga warm-up. The course will have lecture, demonstration, and hands-on components. Participants will receive a Certificate of Completion for 16 NCBTMB CE hours.